At the end of the Apple’s launch of the Apple iPad Air 2 and Apple iPad mini 3 came one more thing: An update to the Apple mini, complete with a price cut. 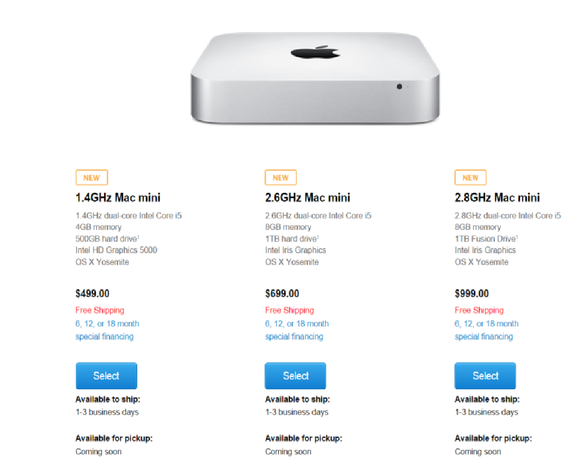 Originally priced at $599, the three new Mac minis will now cost a minimum of $499, scaling up to $999. What Apple’s Phil Schiller, senior vice president of worldwide marketing, called the “world’s most energy-efficient desktop” now includes fourth-gen Intel Core processors, in addition to graphics options that include the Intel Iris and HD Graphics 5000 graphics cores. Connectivity has also improved with the addition of 802.11ac Wi-Fi and a pair of Thunderbolt 2 ports. The basic specs of the mini now includes a 1.4-GHz dual-core Intel Core i5, 4 GB of memory, 500 GB hard drive and Intel HD Graphics 5000, in addition to OS X Yosemite. Think of the Mac mini as the Mac version of the Intel NUC, which Intel launched last fall and has since been picked up by a few other hardware manufacturers. Both boxes are somewhat portable, but are designed to sit tucked on a desk top or shelf, out of the way. Intel upgraded theirs earlier this year, and now it’s Apple’s turn. Apple appears to have prioritized graphics capabilities over processor performance in the mini update. In the Microsoft Surface Pro 3, for example, the top of the line Surface Pro 3 pairs the HD Graphics 5000 chip with the 1.7-GHz Core i7 4650U. Probably a more direct comparison would be the Intel NUC BOXD54250WYKH1, a $350 NUC available on Amazon that also contains a similar processor and graphics chip (but no operating system). As Apple’s spec sheet notes, however, there are other, more powerful options waiting in the wings: specifically a 2.6-GHz midrange model for $699 and a high-end model that includes a 2.8-GHz chip, for $999. All three Mac minis use a variant of the Intel Core, although the higher-end versions pair them with the Intel Iris Graphics chip. That’s a step above the Intel HD 5000 chip, and slightly less powerful than the Intel Iris Pro. Apple’s Mac mini may be a starter Mac for those who haven’t leapt into the higher-end Mac space, but that doesn’t mean they’ll be slowpokes, either. 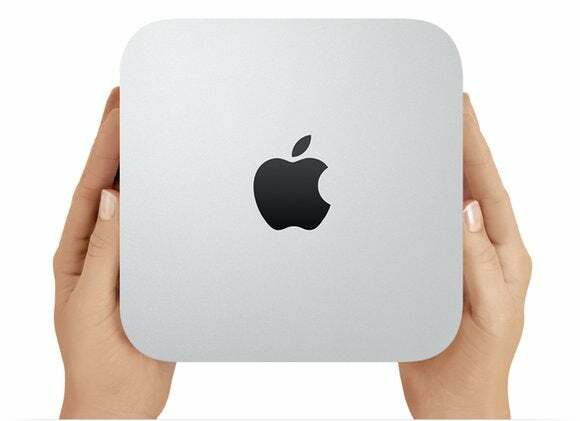 The new Mac minis are available now.